L’Oréal Professionnel Tecni Art Constructor creates texture and shape whilst providing protection from heated styling tools. Style Tip: Don’t be afraid of overloading the hair; you can spray lots of L’Oréal Professionnel Tecni Art Constructor without making the hair feel heavy. Directions for use: Spray L’Oréal Professionnel Tecni Art Constructor on damp or dried hair, then work with fingers under the heat of the hair dryer to create texture. 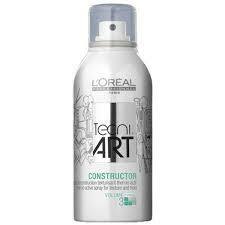 Buy L’oreal Professionnel Tecni.ART Constructor 150ml on-line today at Riah Hair.